"Toy: Cherry Ames Cruise Nurse Book - 2" by Normadeane Armstrong Ph.D, A.N.P. This is book 9 of children’s book series Cherry Ames, written by Helen Wells. 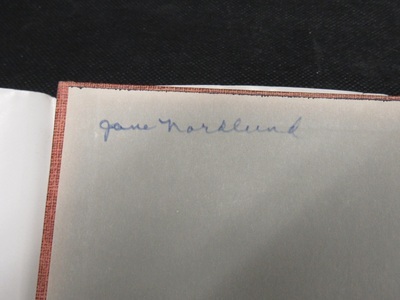 The name “Jane Norland” is written in pen on the inside of the front cover. There is an advertisement for the Vicki Barr books series on the back cover.